"You gotta get a chandelier!" You gotta love a silly SNL sketch (thanks, Fred Armisen & Scarlett Johansson) that just won't budge from your brain... scary too, as this laugh-riot dates back at least two years! Time to clean out the attic! 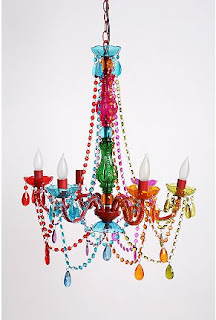 Regardless of my ridiculous brain clutter, I can't help but have a fondness for this candy-hued lighting fixture, a Gypsy Chandelier available from Urban Outfitters. Sure, it's kinda cheesy and perhaps not the type of lighting accoutrement found in a proper "grown up" home but I like it. I also like DQ Blizzards, Snoopy cartoons and ugly dolls so yes, my actual age is probably around 12. Great minds! ;) I wholeheartedly agree with you! Personally, I love it! My grandmother actually has one very similar hanging in her living room. Not quite as colourful but she'd always add multi-coloured lightbulbs for a bit of flair! I think this fixture would look awesome over my dining table. Your grandmother is one cool lady, Myrna.